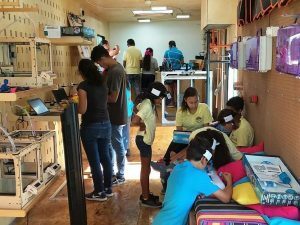 Week two of the Circular City Summer Programme at UvA saw students putting their design and planning skills to the test. 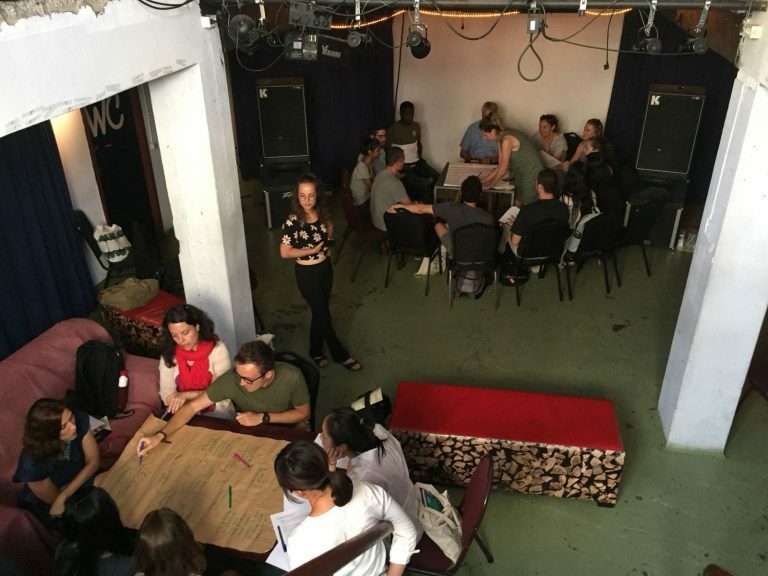 Building on foundations from the analysis phase, this week the group learned how to become ‘circular thinkers,’ using creativity and innovation to produce a circular vision. Student Ludovica Viva shares her thoughts. To start the day, Nadine Galle (Academic Director Circular City Summer School and Consultant at Metabolic) explained to us the principles of circular building, giving us examples of how these are (or should be) translated into practice, starting at the individual building level and then scaling up to areas, and ultimately whole cities. 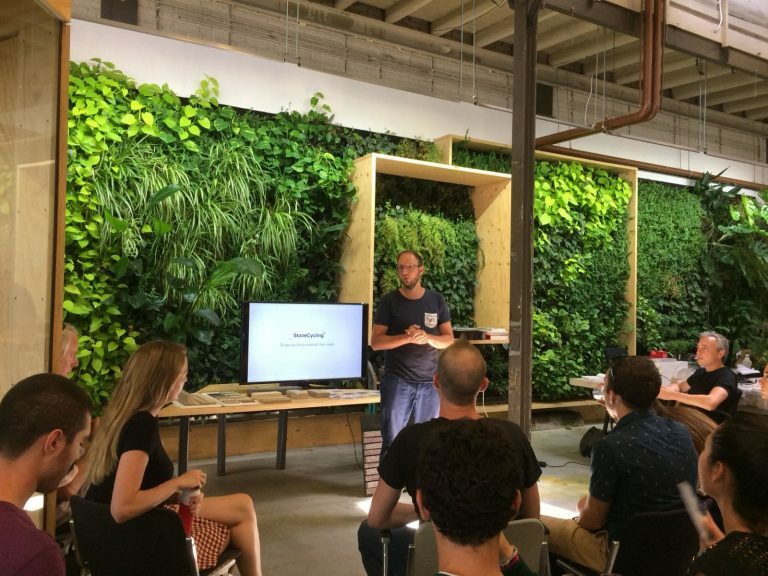 This was followed by a guest lecture from Jan Jongert (founding partner at Superuse Studios), who gave us a rundown on how Superuse Studios became a pioneer in the field of sustainable design. 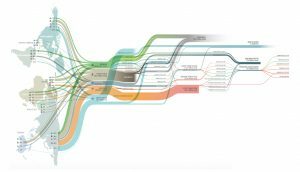 They did this by creating an open data tool capable of coupling supply and demand in construction, in this way avoiding waste and promoting the cycling of materials. In the afternoon, we returned to Buiksloterham, this time to explore the area from a circular building perspective. First stop: StoneCycling, an innovative company that produces new bricks out of building waste. Here Jasper Brommett told us the story of the company and showed us the beautiful and colourful WasteBasedBricks. Second stop: De Ceuvel, where we kicked off a walking tour guided by Annabel Thomas. Annabel is self-building her own sustainable house in the area and told us a bit more about the neighbourhood’s dynamics. Third stop: Noordelicht for a pleasant dinner together. 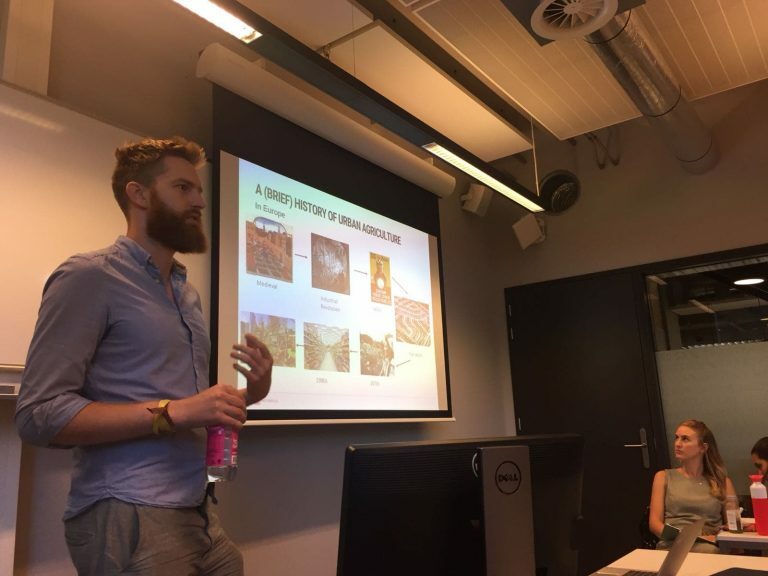 The day started with an interesting lecture on urban agricultural systems given by Thomas Mason (Green Building Team Leader & Sustainability Consultant at Metabolic) followed by Mendel Giezen’s (Academic Director Circular City Summer School, UvA) talk about shifting Amsterdam’s food system to a more sustainable path. After lunch, the class travelled to the headquarters of Taste Before You Waste (TBYW) to meet project manager Sophia Bensch. Here Sophia told us more about TBYW’s work around fighting food waste and get us all involved in a brainstorm to try and solve different issues the organization is currently facing. 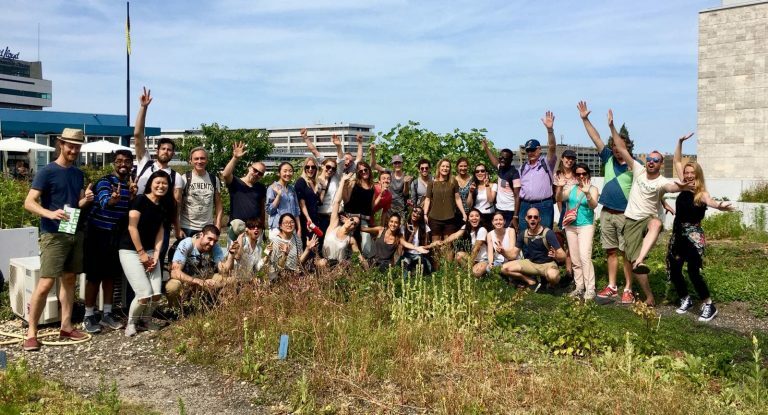 When it comes to urban development, it is important to integrate sustainability right from the early stages. 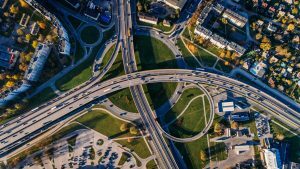 At the same time, it’s critical to coordinate the needs and wants of the many stakeholders involved, and be adaptive towards the already-existing context. 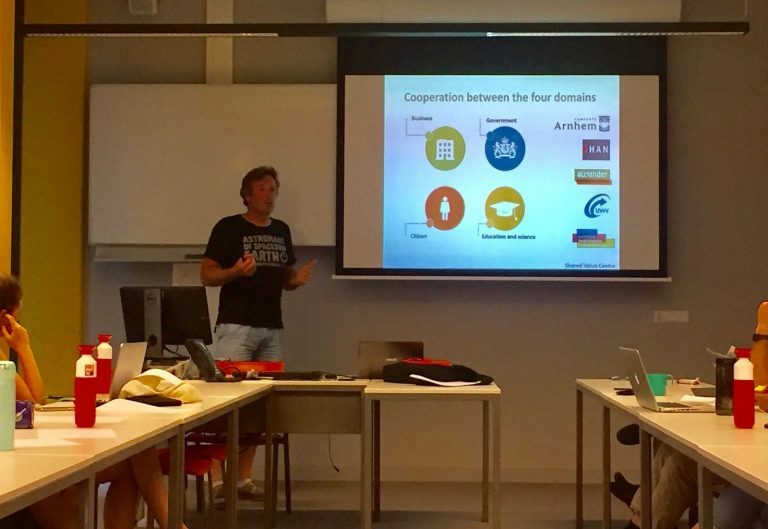 This can be a very challenging task, and Karlijn Kokhuis (Urban Development Consultant at the Municipality of Amsterdam) brought us concrete examples of the challenges that Amsterdam’s municipality is currently facing in the planning of a big urban development. The discussion then continued with the academic directors Gerard Roemers and Mendel Giezen. 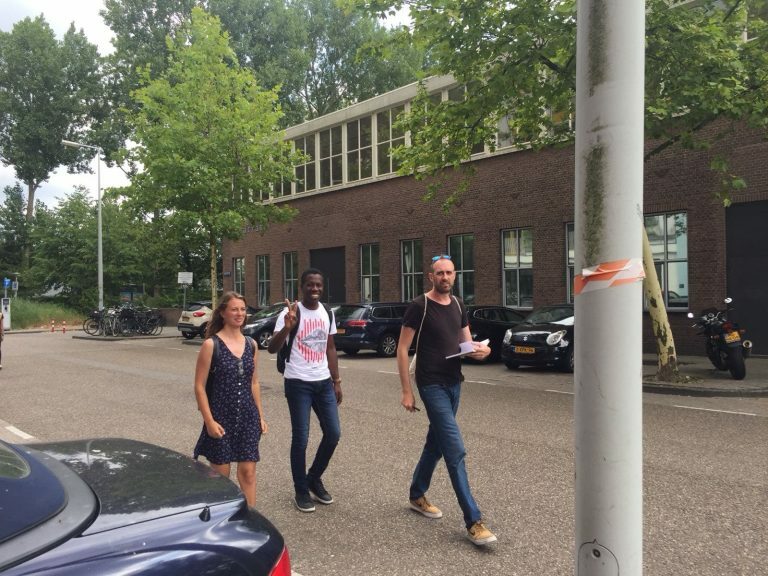 In the afternoon, the class went for an urban expedition into an industrial area, the Schinkelkwartier, where urban development planning is underway. Here, the students divided into groups and went around the neighborhood collecting information and opinions from the people currently working there in order to understand what would be the best development path for the area. 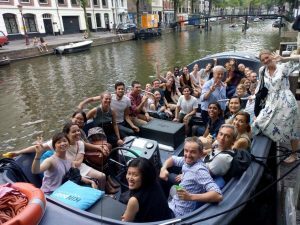 To end off the week on a high, the class went on an exciting trip to Rotterdam. Here, besides admiring the architecture and enjoying the city’s atmosphere, we visited two absolutely inspiring places. 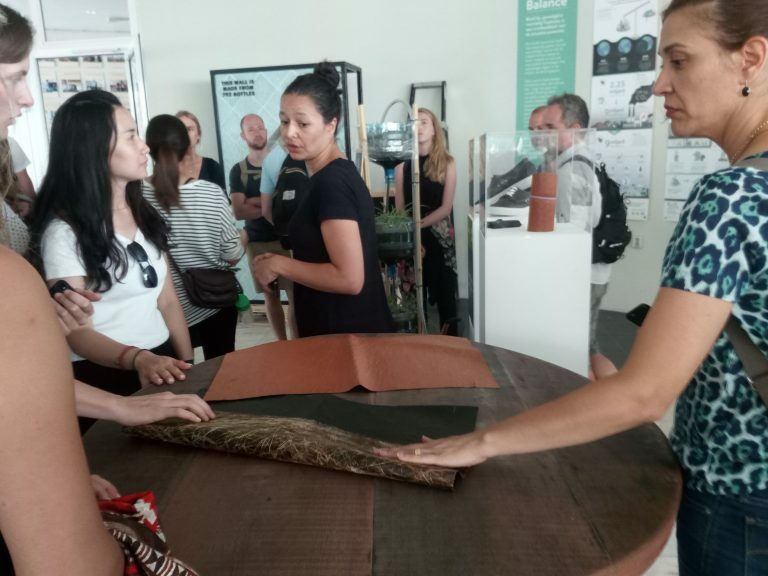 In the morning we had a tour at BlueCity where many startups and innovative companies collaborate and produce sustainable products, such as leather from waste fruit or bacteria, and polystyrene-like packaging material from cardboard waste. After a delicious plant-based lunch (created from mushroom grown on coffee residue) on Aloha’s sunny terrace, we moved on to the green rooftop at DakAkker. 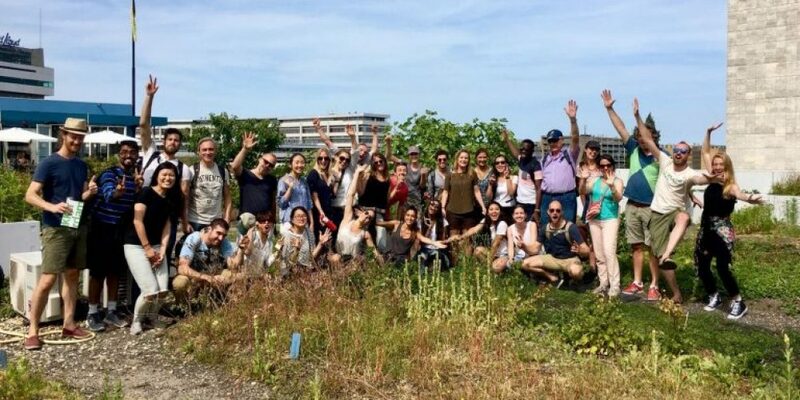 Here, a former roof has been transformed into a wonderful garden where vegetables and flowers are grown, compost from organic waste and honey from a bee-farm are produced. 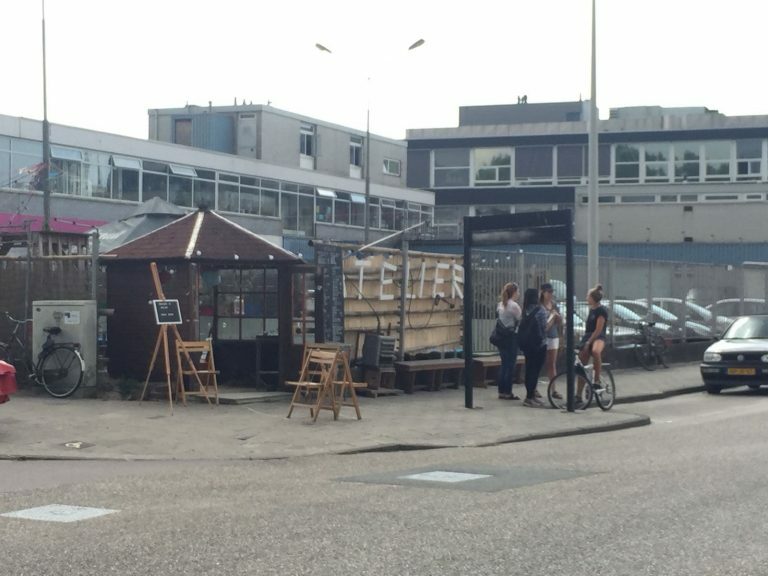 The roof also works as a cooler in the summer and as a recreational escape from the city, at only 5 minutes walking distance from Rotterdam central station. Again, a week of dynamic discussions and enthusiastic participation from everyone, including extra lectures and trips! 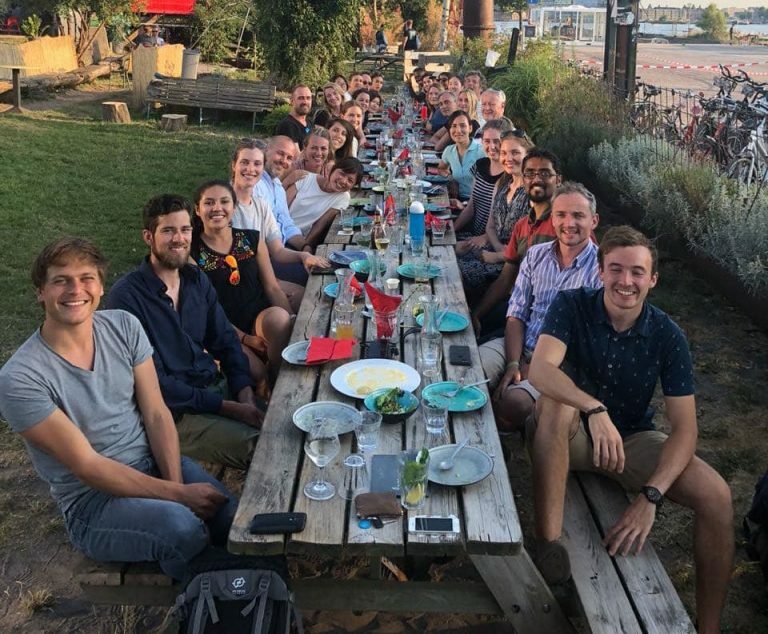 For instance, student Patrick Hoogenbosch gave us a lecture on how he and his colleagues are working to transform their neighborhood – the Spijkerkwartier in Arhnem – into a hotspot for the blue economy. 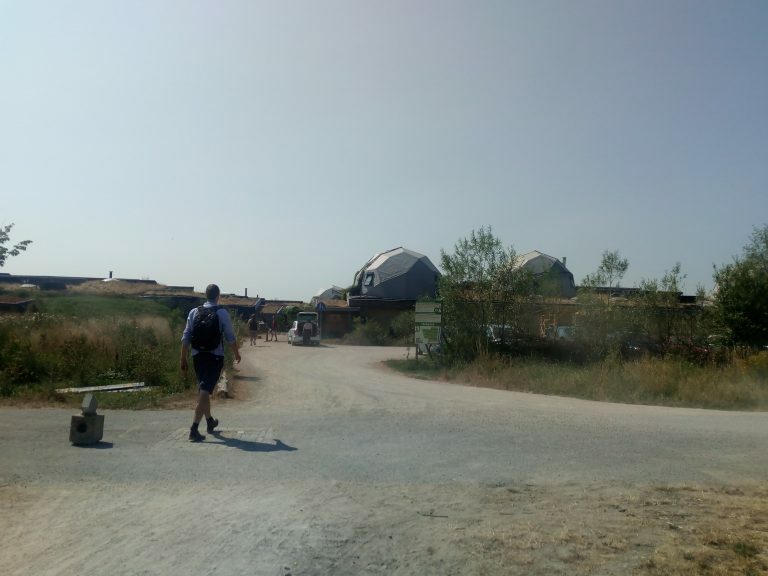 Student Philippe Rol organized a tour focused on circularity initiatives in his hometown Eindhoven, and Florijn de Graaf (Sustainable Energy Systems Engineer at Spectral) kindly offered to give us a tour of the amazing “Aardehuizen” or “Earthship” community in Olst. Julian: “The lecture from Jan Jongert was great. Jan told us about how his company, Superuse Studios, tries to create a more sustainable built environment. Their creativity when it comes to resource use and re-use was inspiring. For instance, I liked the way Superuse re-purposes old wind turbines into children’s play equipment, and uses steel offcuts to make decorative feature walls for buildings”.